Who Was the Real Margaret Sanger? is a three-video series accompanied by structured classroom activities and projects. This unit study will help students understand the impact of the contraceptive mentality on the legalization of abortion, identify the connection between the eugenics movement and the Nazis, and recognize the ties between the sexual revolution and destruction of the feminine genius in society. Margaret Sanger can be completed in three class periods. This supplement package comes with a teacher manual, student handouts and worksheets, and a DVD containing the videos and all of the printable appendices. 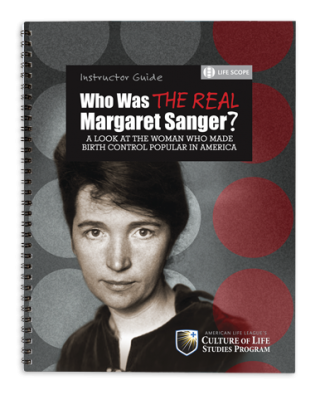 Purchase Who Was the Real Margaret Sanger? 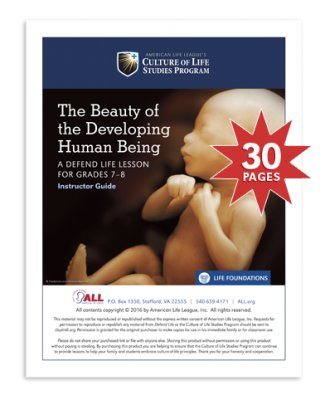 Defend Life: The Beauty of the Developing Human Being explores the science of the earliest moments of a person’s life and lays a firm foundation for students for why every human being’s life needs to be protected from creation until death. 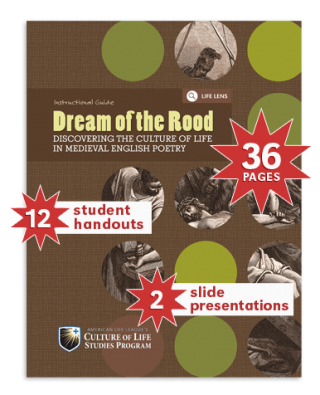 Dream of the Rood is a short supplement that focuses on a medieval epic poem and can be used with classes on British literature, medieval literature, religion, any English course, or in conjunction with the CLSP study on the papal encyclical Evangelium Vitae. Dream of the Rood helps students understand the literary archetype of a medieval hero, identify how the poem portrays Christ as a traditional medieval hero, recognize the life-giving gift of Jesus’ death on the cross and power of redemptive suffering, and apply the concept of hero to the pro-life movement. Designed for maximum course compatibility and flexibility, Dream of the Rood can be completed in one to three class periods. This unit study is available as a PDF download. Euthanasia: An Introduction examines the complex topic of euthanasia by peeling back the layers of rhetoric to let students see what is really at the heart of end-of-life issues. 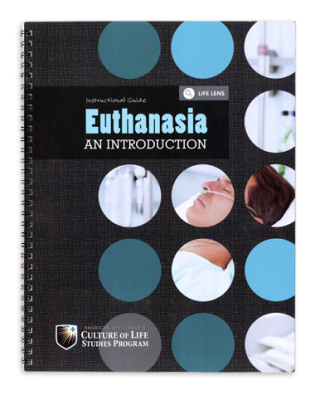 This supplement provides students with a basic understanding of the Catholic Church’s teachings on euthanasia and gives the tools for defending those teachings against cultural attitudes and pro-euthanasia arguments. An introductory course, this supplement takes only one class session to complete. Euthanasia and Physician-Assisted Suicide will be available in an edition for high school students as well as a less-demanding edition for junior high students. Learn more about Euthanasia: An Introduction here. In our Miracle of Life Activity Book, children ages three to six will learn about the development of a preborn baby through scientifically accurate, yet kid-friendly coloring pages and activities. This book teaches children the beauty of life, family, adoption, and being uniquely created by God. Appealing to very young children, this book includes pro-life themed mazes, connect-the-dots, and beautifully illustrated coloring pages. 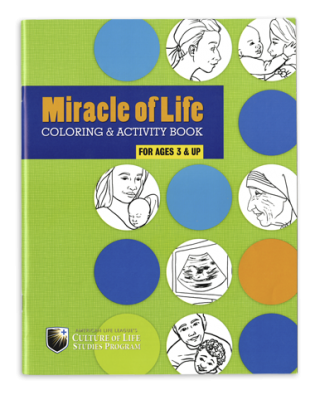 Learn more about the Miracle of Life Coloring & Activity Book here. Life Is Precious illustrates the basic facts of early human development using scientifically accurate yet kid-friendly coloring pages and traditionally published picture books. In consultation with a leading embryologist, as well as veteran homeschool parents, we created this 4-week unit study to provide students with accurate information to enhance learning. 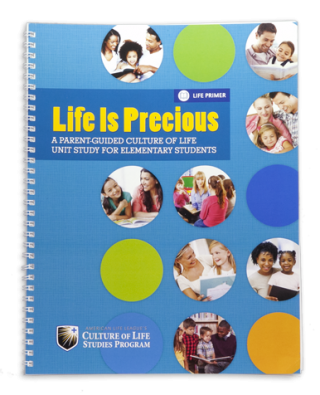 Designed to complement any existing curriculum in grades K-2, Life Is Precious is a parent guided resource which helps instruct children about the truth of human development while still respecting their innocence. Each study purchased contains a precious 12-week fetal model for parents to illustrate key concepts from the study and a DVD containing all of the printable appendices and coloring pages. Other features include Bible activities, games, and crafts, which engage students in multifaceted, active learning. The picture books needed for this unit study are sold separately. Learn more about Life Is Precious parent guide here. Using themes from popular children’s picture books, Life Is Precious School Edition is a resource for teachers and students that illustrates the basic facts of human development and caring for others. Designed to complement any existing school curriculum in grades K-2, Life Is Precious School Edition instructs children about the truth of human development while still respecting their innocence. It was specifically designed for a classroom or religious education setting and is a fun, easy way to learn about the value of each human being. Each study purchased contains a precious 12-week fetal model for teachers to illustrate key concepts from the study and a DVD containing all of the printable appendices and coloring pages. The picture books needed for this unit study are sold separately; only one copy of this supplement is needed for a classroom of students. 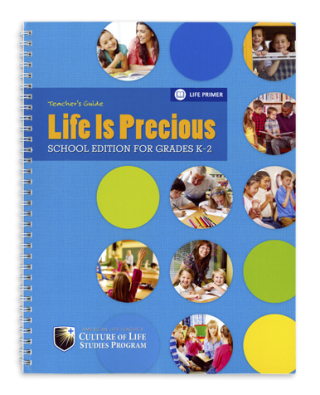 Learn more about Life Is Precious School Edition here. Find our e-lesson library here. Life Is Sacred is a unit study on family life for 5th-6th graders. In this 4-week study, students will learn about a preborn baby’s development, the Church’s teaching on marriage, how we are all created with unique abilities, and how we are obligated to defend and protect every human being as bearers of the gospel of life. Kids of any age are curious about babies. Through lessons, Bible stories, lives of heroic saints, and Bible memory verses, this study presents students with the science how a preborn baby grows and develops to help them understand the sacredness and inviolability of every human being’s life. Students spend an entire unit studying disabilities, God’s plan for the family, and what it means to stand up for the defenseless. Like our other studies in Life Primer and Life Foundations, we respect that parents are the primary educators of their children. Our lessons protect the innocence of the students while still providing them with a pro-life foundation. Working in collaboration with a leading embryologist, we’ve ensured that all the information we present is accurate and scientific. Upon completion of this course, students will have learned what it means to be pro-life and will be armed with the vocabulary they need to start articulating their pro-life beliefs. This supplement is still in production. Defend Life shows junior high and high school students what it really means to be pro-life. Students spend four weeks examining such diverse pro-life topics as a preborn baby’s development, marriage and family, chastity, threats to the dignity of all human being, how to argue the pro-life position, and how to spread a culture of life to their peers and their communities. Student develop critical thinking and speaking skills through fun activities such as a pro-life gameshow, pro-life apologetics, and pro-life action activities which help them take what they have learned in the classroom out into the world. Two more lessons from this unit study will be released as a PDF download in 2017. Defending the Downtrodden is a comprehensive study on the great English novel Oliver Twist by Charles Dickens. In this 8-week study, high school students will gain a solid grasp of the main characters and literary themes in the novel, familiarize themselves with Victorian history and culture, and learn to apply the culture of life lens to their reading of the novel. Defending the Downtrodden explores themes such as mercy, justice, capital punishment, writing for social reform, and protecting the innocent. This supplement package comes with a teacher manual, student handouts and worksheets, and a DVD containing all of the printable appendices and presentations. This supplement is still in production. Abortion Law in America is a unit study that focuses on helping students understand how abortion law was crafted and implemented by looking at the Supreme Court cases from 1973 that legalized abortion in all 50 states. Abortion law did not begin with Roe v. Wade in 1973. The Supreme Court used contraception cases in the 1960s that allowed the justices to create language and a precedent that enabled them to pass abortion laws a few years later. The lesser-known abortion case that was passed on the same day as Roe, Doe v. Bolton, has an equally important role to play in the shaping of our nation’s legalization of abortion-on-demand. Students will explore and unpack complex terms used by the Supreme Court justices, such as “right of privacy,” “fetal viability,” and “persons under the law,” to decipher the agenda behind the language of abortion law. This supplement is still in production. Evangelium Vitae examines the encyclical by Saint John Paul II on the gospel of life. Offered as either a 4-week or 8-week supplement, Evangelium Vitae teaches high school students to identify current threats to the culture of life, live the Christian principle of respect for human dignity, understand that there are no exceptions to God’s holy law, and to proclaim the truth without apology in every stage in life. Both supplements emphasize close reading of the encyclical, engage students with real-life scenarios to stimulate discussion, and explain the origins, purpose, and meaning of the gospel of life. Each supplement comes with a teacher manual, student handouts, and a CD-ROM containing all of the printable appendices and presentations. This study is still in production.